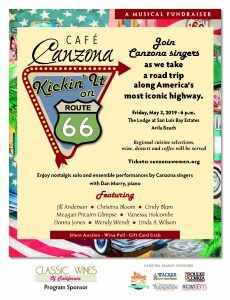 Canzona Women’s Ensemble will present the fundraising concert, “Café Canzona – Kickin’ it on Route 66” on Friday, May 3, 2019 at 6 p.m. at the San Luis Bay Estates Lodge in Avila Beach. The evening will feature musical selections from stops along this iconic highway including “King of the Road,” “California Dreamin’,” “Along the Santa Fe Trail,” “Meet Me in St. Louis” and others – in addition to regional food selections, fine wines, delicious desserts and coffee. There will also be a diverse selection of auction items available for bid, as well as a wine pull and gift card grab. The evening will feature 8 of Canzona’s leadings singers and pianist Dan Murry. This special performance will take place on Friday, May 3 with doors opening at 6 p.m. for social hour before the show begins at 7 p.m. A limited number of tickets are available for $75 per person or $140 for a couple at BrownPaperTickets.com. Canzona holds a unique place in the community as a champion of choral music for women’s voices. The non-profit is a selective auditioned ensemble that includes 24-28 women from around the county. Their mission is to further a love and appreciation for women’s choral literature, to expand this literature by commissioning original pieces, and to present the music with consistent excellence. The 24-voice group is led by co-directors Cricket Handler and Jill Anderson and accompanied by pianist Janis Johnson. Canzona is celebrating their 10th anniversary season this season. 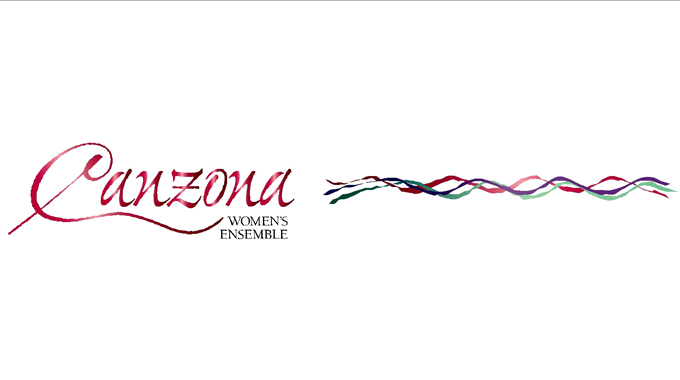 For more information about Canzona Women’s Ensemble, visit canzonawomen.org or call 805-391-SONG.